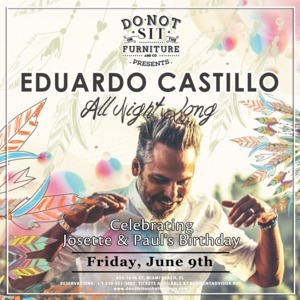 Friday, June 9th, Do Not Sit On The Furniture presents➳➳➳➳ Eduardo Castillo (Habitas) ➳➳➳➳ALL NIGHT LONG!http://soundcloud.com/eduardocastilloAt Do Not Sit we truly believe in bringing the best quality music to our friends and music lovers... It's all about going on that magical journey together and connecting on so many different levels! And with this said, it's with great pleasure that we welcome back our good friend Eduardo Castillo [playing from open to close], for this enchanting night! We will be celebrating the birthdays of our good friends Josette & Paul as well!➳➳➳➳ EDUARDO CASTILLO ➳➳➳➳Eduardo Castillo has been described in many ways but the one of the best depicts precisely what his musical offerings are all about..."musical enchanter". Eduardo's mission when he plays, always, is to become a storyteller from beginning to end. Every record he plays has a very important intention. The music in his selections does not just fill time, it weaves in and out with dynamic and texture. The music and his improvisational live remixing are brush strokes on a canvas that once he's reached the end, will look like a world of realism and fantasy all in one. He's a master at layering the musical with the technical and the surreal with the real. Eduardo always leaves an indelible mark with his style and impeccable understanding of his environment.Eduardo Castillo has released on the groundbreaking Crosstown Rebels label and is the founder of the infamous VOODOO and GYPSET events from Los Angeles as well as HABITAS.